This rotary phase converter/voltage stabilizer combination is designed specifically for three-phase CNC/PLC machines. Can be used with AC and DC motor drives or voltage sensitive three-phase equipment operating from single-phase power source. Provides balanced voltages necessary.for dependable operation of voltage-sensitive equipment. Balance close to + 5% or less between legs. Keeps output voltage stable during peak loads, helping most CNC/PLC and other voltage sensitive equipment to operate properly. Most.CNC/PLC machines require a CNC PAC™ 1-1/2 to 2 times larger than the spindle motor to accommodate the extra amps for starting, instant reversing, and for the servos, hydraulics, etc. The correct size Rotary Converter.is determined first. 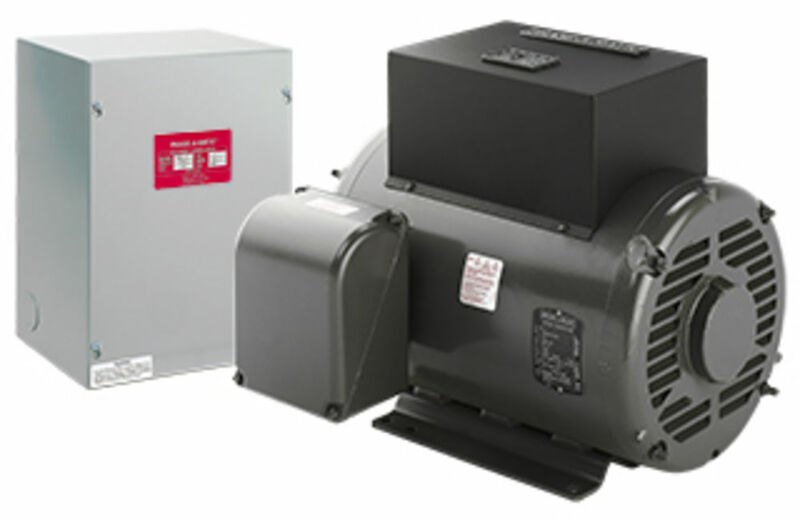 In most cases, the Voltage Stabilizer is required to be of the same HP rating, or size.